Beekeeping has become a very popular hobby in the U.S., especially in cities like Seattle and Portland where it’s not only legal to keep bees in your yard, but encouraged. Many people undertake this extremely joyful undertaking, but many people fail. Not out of lack of desire or love, but because there are many aspects of beekeeping that require attention and detail. What Does Beekeeping Entail? Anyone can keep bees, all you need is a spacious yard, some equipment, and a passion to help struggling bee colonies. Seattle allows you up to four hives in your yard, but most new keepers opt for two. I can help you get all this started, from selecting books, to buying equipment, to installing your bees! It’s all part of a service I offer. Bee Packages. Ok, after setting up your hive(s), you now need bees!! Most new beekeepers opt to buy what’s called “package bees”, which is three pounds of bees (that come in a special box) that will be moved into your hive. Typically packages are available from April until May and once they are gone, you have to wait another year. We sell these packages in limited numbers, and can even help you install them. Jason tending his downtown Seattle hives. Colony Collapse, Parasites, Diseases! There are plenty of things that can kill or weaken bees. Fungus, varroa mites, sicknesses all can quickly kill a colony. A skilled beekeeper can keep an eye out for signs and make necessary corrections. Working with an experienced beekeeper can expedite your learning, so find an experienced mentor! Consultation. New and even experienced beekeepers need help from time to time. If you have questions or concerns about your hive, let us know and we can come out to consult. Hosting. Because some people would like to keep bees, but either do not have the time or resources, Woodland Bee Company offers a hosting program where we place bees into your yard and take care of all aspects! We charge a service fee that goes directly to serving the bees in your yard. Swarms….. May and June is swarm season. Don’t be scared if you see one, but rather enjoy the sight, from a distance. It may look scary, but it’s really not. If you do have a swarm, we can come collect it and rehome the bees in a new hive, thus giving them a wonderful chance to live another year. Honey?? Did you know most of the honey you buy in the grocery store is not “real” honey? Most of it is fake or substitute. The best way to ensure you get real honey is to buy from a beekeeper. Yes, we can help you with that, let us know if you’d like 100% pure honey. 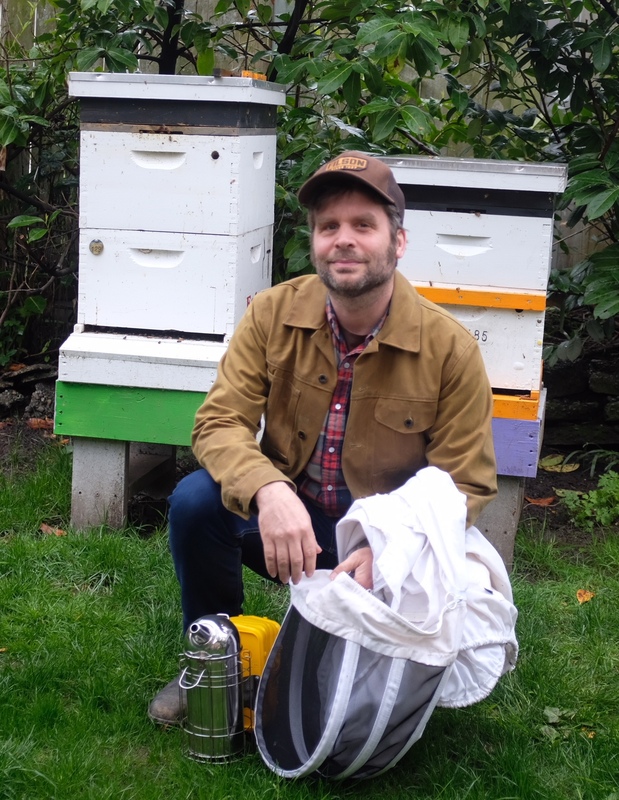 After keeping bees in my West Woodland yard in Ballard, then working at Ballard Bee Company for some years, I started my own beekeeping company, eventually named Woodland Bee Company. I have bees in over 20 different yards across Ballard, as well as at Google, Pacific Science Center and on the Columbia Center downtown. I love my bees, love my hosts and love spreading the word and am certified with the state of Washington and Montana as a beekeeper. When not keeping bees I’m active in the Ballard music community and can often be seen getting dragged around West Woodland with my black lab Simon.